A person who rejects company size lingo and orders their beverage in small, medium and large. Discomfort associated with a barista pressing a dirty thumb on the lid’s sipping-hole while affixing it to your cup. When you can stand in one Starbucks and see another, such as at Astor Place. Removal of unwanted beverage by pouring it into the trash, usually to make room for milk. When two or more customers reach for the same beverage, unsure of its ownership. When you are forced to wait for the milk thermos you need. 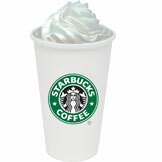 A high-calorie, high-fat beverage such as the Caramel Mocha ordered with skim milk to reduce guilt. The act of waiting until the employee can see you place money in the jar, so you can get credit for it. To forget that the customer wanted room for milk and fill the cup to the brim. A person seated so you can see the mediocre screenplay on his laptop.